Using some of the whitetail deer hunting strategies developed by professionals and non professionals can increase your chances of having a successful hunt. The strategies can vary depending on the location and time of year the hunt will take place. For example, hunting deer in a state that is primarily flat and agriculture based requires a much different strategy then hunting deer in a hilly or mountainous state with plenty of thick brush. A strategy for hunting bucks during rutting season will be different than a strategy for hunting before rutting season starts. There are some strategies that apply across the board though. For example, you should learn how to locate funnels, ridge lines, creek bottoms, swamps, deer trails, which are some of the ideal locations for spotting whitetail deer. Another common strategy, no matter where you live, is to locate the watering holes used by deer. Whitetail deer must drink water every day, so finding the popular watering holes can greatly increase your chances of spotting plenty of does and bucks. 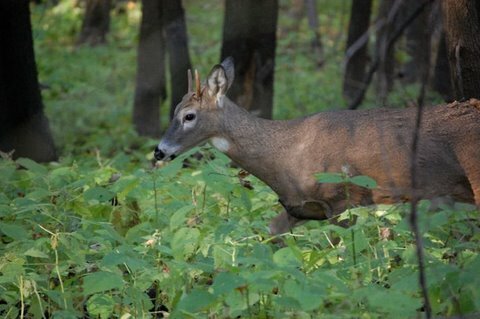 Any hunting strategy you use is predicated on having an understanding of how whitetail deer move, feed and breed. For example, when you know deer will gravitate towards corn fields, then a good strategy is to hunt a funnel that connects two agricultural fields. When you know the big bucks will stay out of sight right off a main deer trail, your hunting strategy will be to locate your stand so you can see them in the thick cover they use to their advantage. Do As I Say . . . and As I Do! Most hunters dream of bagging the trophy buck during a hunt. They may or may not admit to this, but if you could look deep into their private thoughts you are sure to find images of the monster buck with the perfect, record breaking, typical rack. Using the right hunting strategies is the best way a hunter can pursue the dream. Thank goodness avid hunters and hunting professionals are more than willing to share their success by sharing their strategies. There is no way to describe all of the strategies which can help you become a successful hunter. A good hunter will do the research and develop a set of whitetail deer hunting strategies that enable him or her to handle a variety of situations. 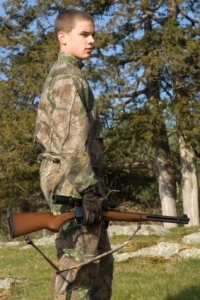 For example, you need a strategy for hunting when the fall season is unseasonably warm or when it's windy. You need a different strategy for hunting in cold weather or when it's raining. Hunting professionals and non-professionals offer a lot of great advice for dealing with the unlimited number of hunting conditions that may be found. You can learn strategies for hunting when the hunting pressure on an area has reached its peak and the deer go into hiding. Other strategies deal with successfully shooting from stands or blinds, spotting signs of deer, preparing hunting lands in the off-season to attract deer, and many others. In the case of whitetail deer hunting strategies, the best advice you can get is to gather all the knowledge you can and then try what feels right for you. Most important is to keep a journal and record in it everyday I can not stress this enough and will many times on these pages! » Return to "Whitetail Deer Hunting Tips" from "Whitetail Deer Hunting Strategies"
I would not hesitate to harvest the Whitetail Buck above. Not considered by many to be a trophy deer. To me its hard to eat the horns.